Dr. Heather Gray-Edwards, right, and laboratory technician Kalajan Lopez. Genetic disorders and diseases caused by failure of mechanisms that regulate gene expression, or the processing of gene products, can have devastating effects on both humans and animals. Pioneering advances in gene therapy and molecular medicine at the Auburn University College of Veterinary Medicine (CVM), one of which is nearing human clinical trials, hold promise for a brighter, healthier future for us all. In the Scott-Ritchey Research Center, CVM scientists Dr. Doug Martin and Dr. Heather Gray-Edwards lead efforts on GM1, Tay-Sachs (TSD) and Sandhoff (SD) disease research. With several years of documented success in animal models, a therapeutic strategy for treatment of GM1 gangliosidosis should enter human clinical trials in the coming year. 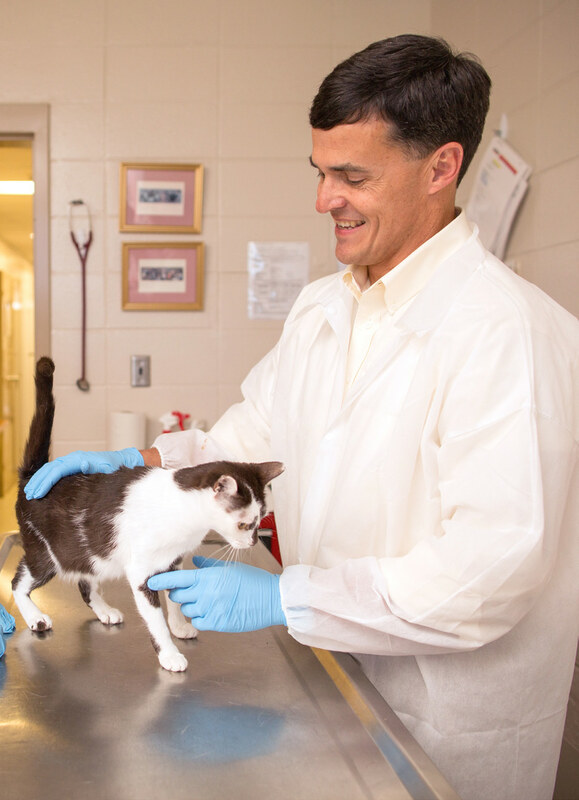 Dr. Doug Martin examines one of the cats in the GM1 study. GM1 gangliosidosis is a rare, inherited neurological disease. A lysosomal storage disease that attacks the brain and spinal cord, it is a progressive, degenerative condition that is always fatal in children. This genetically heritable disease affects about one in 200,000 people. These diseases are also found in cats, dogs and sheep. By taking advantage of a unique feline model developed at the Scott-Ritchey Research Center, the Auburn CVM research team has developed a gene therapy protocol that has proven successful in treating GM1. Moreover, their findings could lead to refinement of gene therapies for other neurologic diseases. Dr. Martin and Dr. Gray-Edwards are members of the Tay-Sachs Gene Therapy Consortium, an international collaborative group of scientists committed to searching for a cure. This team developed and tested a delivery system, or “vector” based on the adeno-associated virus (AAV). The vector is currently being made at Nationwide Children’s Hospital in Columbus, Ohio, one of America’s largest pediatric health care and research centers. Once the toxicity study on mice with the vector is completed, the company will begin to produce the vector for human clinical trials, which is expected to be in 2018 at the NIH. The development of a treatment for GM1 gangliosidosis using AAV gene therapy was initiated in 2005 by Dr. Martin, a professor in the Department of Anatomy, Physiology and Pharmacology at Auburn, and Dr. Miguel Sena-Esteves, an associate professor in the Neurology Department at the University of Massachu­setts Medical School. GM1 glangliosidosis is caused when the body does not produce enough of a specific enzyme, β-galactosidase (βgal), which recycles molecules from the body. When the molecules build to abnormal levels, they progressively destroy the body’s nervous system. The earlier the onset in children, the more quickly the disease kills. Dr. Sena-Esteves and Dr. Martin re-engineered the virus to introduce the gene that produces βgal. The virus acts as a vessel, its genetic material is removed and replaced with a concentrated dose of the βgal gene. Healthy cells pass along βgal, essentially allowing deficient cells to soak in the crucial enzyme. The experimental gene therapy has extended the lives of cats, which have a similar genetic defect, from an average of eight months to more than 57 months, with no ill effects, and with normal function. Dr. Martin and a team of researchers have found success in administering the virus two ways: The first, and most successful, is by intracranial injections through the skull, which has succeeded in getting therapy beyond what is called the blood-brain barrier. Because of the risk of brain injection—especially in children already suffering from a neurologic disease—a less invasive alternative is now on the fast track for human clinical trials. This second method is the development of an intra­venous treatment which provides sufficient doses to the brain through the blood system. “This method has proven successful, but we have to administer more of the vector to ensure enough of it is in the brain,” he added. This team has also achieved similar success in the treatment of animals with GM2 gangliosidosis (Tay-Sachs and Sandhoff disease). Both cats with Sandhoff disease and sheep with Tay-Sachs benefited from gene therapy devised by this team. Human clinical trials are also in the planning stages for for Tay-Sachs and Sandhoff disease. Gene therapy studies in Tay-Sachs sheep are particularly important because the scientists have successfully demonstrated the same therapeutic principle in a brain similar in size to that of a child. These results indicate that the same success may be possible in a child’s brain, says Dr. Heather Gray-Edwards, an assistant research professor at the Scott-Ritchey Research Center. “We now only need to raise more funding to be able to take these therapies to clinical trials in human medicine,” Dr. Gray-Edwards said. 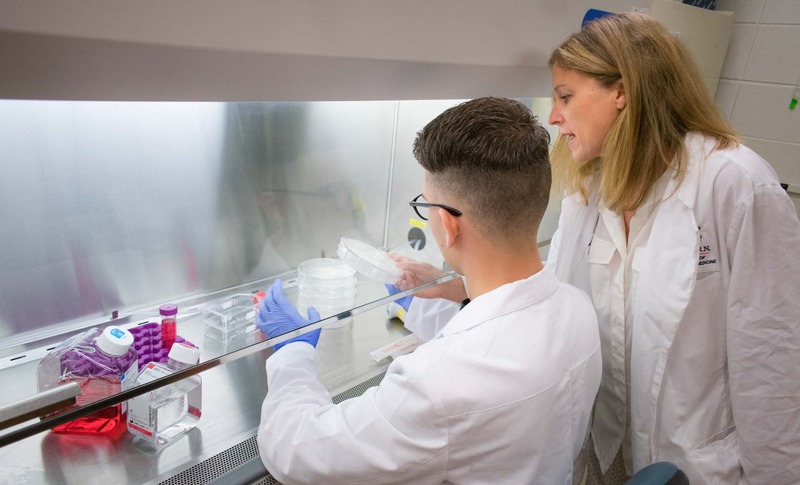 The College of Veterinary Medicine is also home to other cutting-edge research programs at the molecular level focused on cancer and other diseases. 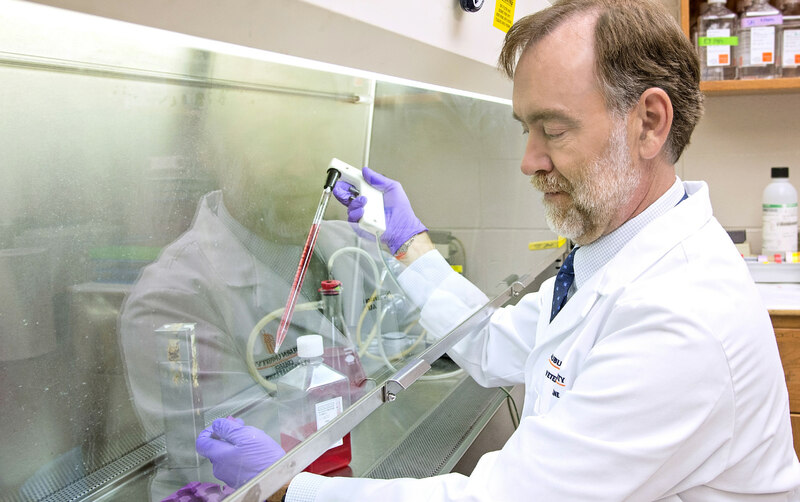 In his laboratory at the Scott-Ritchey Research Center, Dr. Bruce Smith, a professor in the Department of Pathobiology, is seeking cures for both muscular dystrophy and cancer using gene therapy, and by monitoring immune responses to therapy. In muscular dystrophy research, Dr. Smith has identified X-linked Duchenne-like muscular dystrophy (DMD) in four different dog breeds. He has found the mutations in three of these breeds (Welsh Corgi, Labrador Retriever, Labradoodle). He and his team are currently working on identifying the cause in the fourth breed, the English Springer Spaniel. In cancer research, Dr. Smith is working to create new treatments for a wide range of cancers in both dogs and people. His current work is focused on developing oncolytic viruses. These viruses are engineered to infect and replicate inside cancer cells. They kill the cancer cell directly, by destroying it from the inside, and also by attracting the attention of the immune system. Initial clinical trial results in dogs with bone cancer garnered promising results, and the group is now devel­oping the second and third generations of the virus. Dr. Valery Petrenko, a professor in the Department of Pathobiology, pioneered use of bacterial viruses (bacte­riophages) in molecular medicine. He and Dr. James Gillespie, an assistant research professor in the same department, are collaborating in research focused on developing targeted anti-cancer nanomedicines. Traditionally, targeted nanomedicines identify proteins that are over-expressed on the surface of tumor cells, or on the blood vessels in tumors, and rely on defects in tumor blood vessels for their increased tumor killing ability, he added. “Recently it has been suggested by us and other groups that the role of the tumor microenvironment may be preventing the efficacy of some nanomedicines to reach their full potential,” Dr. Gillespie said. Dr. Tatiana Samoylova, a research professor with Scott-Ritchey Research Center and the Department of Pathobiology, is focused on development of contraceptive vaccines for wild and feral animals. Her research involves cats, dogs, and pigs, using phage as a vector for immuno­genic peptides. Such contraceptive vaccines are composed of whole phage particles carrying immunogenic peptides, where the phage body plays the role of a carrier protein/adjuvant and multiple peptide copies stimulate production by the animal of anti-peptide antibodies. These antibodies interfere with male and female repro­ductive functions, leading to reduction in fertility. The vaccine is designed to include phage particles carrying multiple copies of gonadotropin releasing hormone (GnRH) peptides, she explained. Animals respond to such vaccines by producing anti-GnRH antibodies, which are known to affect fertility, reducing or preventing pregnancies. Other uses of such GnRH-based vaccines may be in the treatment of human and animal hormone-dependent reproductive cancers. Species specificity is one of the major requirements for an ideal contraceptive for wildlife since such vaccines need to be distributed in uncontrolled environments where they could contact non-target species, resulting in unwanted loss of fertility in the non-target animals, she adds. The approach is unique and protected by U.S. Patents. Potentially, it can be applied to population control of multiple wildlife species. In addition to established gene therapy and molecular medicine research programs at the College of Veterinary Medicine, recent additions to the faculty through the Cluster Hire Initiative in both pharmaceutical engineering and omics/informatics bring broader strengths to this promising field of research and discovery.